I don’t think I’ve ever downloaded a free Kindle book from Amazon, but I’ve seen some of my Facebook friends mention that they regularly read free Kindle books. I recently received a tip through my contact form, suggesting a site that lists over 33,000 free Kindle books. If you share your Kindle account with someone, it could be a headache to read a book that the other person has already read. The problem? If you use Amazon’s Whispersync technology, your Kindle will think that the furthest read location is the end of the book (or wherever the previous reader left off). I previously wrote about the convoluted process you could use to reset the furthest read location on your Kindle. Fortunately, Amazon has now come up with a much easier way to reset the furthest read location. After a long love affair with Bioware games, I’ve found myself smitten with Skryim, by Bethesda. As with the other two games in the Elder Scrolls series that I’ve played, Morrowind and Oblivion, Skyrim features a huge, do-anything world for you to explore. Unlike those two earlier games, Skryim has me completely addicted. If you’re not playing it, you’re missing out on one of the best games in years. Skyrim’s world is tremendously immersive. The number of books that you’ll find all over Skryim adds to that immersion. The drawback with the number of books that you can find is that reading them takes some time. I have limited time, so I wanted a way to read the books when I wasn’t in front of the computer. Thanks to an enterprising gamer, you can do just that. We’ve previously talked about a few ways to make web pages more readable, and we’ve also covered an extension to do the same in Chrome and Firefox . That’s on the PC, though. How about on the Kindle? The Kindle has an experimental web browser that can do the trick in a pinch, but it isn’t the most pleasant experience, given the Kindle’s limitations. There is a trick, though, to making web pages a bit easier to read on the Kindle. Borrowing eBooks is a great way to get your free on in Kindle-land, but if you want to actually own the books — and not be subject to time limits — then check out eReaderIQ. Sure, you probably won’t find the latest best sellers, but you will find a lot more than just public domain. The price drop notifications don’t hurt, either. eReaderIQ is fairly easy to use, though the interface is a bit busy, and they have recently added a Kindle-friendly version of the site so you can browse right from your device. The database is updated hourly and is region-specific, which helps you to avoid any cross-border licensing disappointments. The 10 regions cover the planet, for the most part, though some are very generalized (like “Asia & Pacific” — does it include Russia? Who knows?) and there is a note at the bottom of the site that states prices and availability are accurate for US customers, regardless of the region you choose. It should also be noted that the book links take you directly to Amazon.com, not the Amazon site that is specific to your country. You don’t have to register for anything, or provide any personal information at all to eReaderIQ for it to work, but if you do provide your email (upper-right corner of the site) you will be notified up to twice per day of any new free Kindle eBooks outside of the public domain. You can also watch specific books for price drops by adding the ASIN or Item URL, your price-drop Notification Threshold, and your email address. Another cool feature of the Price Drop Tracker is that you can see a list of books that others are watching (again, with no identifiable information), and can sort by percent of the drop, recent price drops, and most watched. There is also an icon legend to quickly note things like Text-to-Speech, Lending Enabled, etc., which makes it easy for you to find what you are looking for. 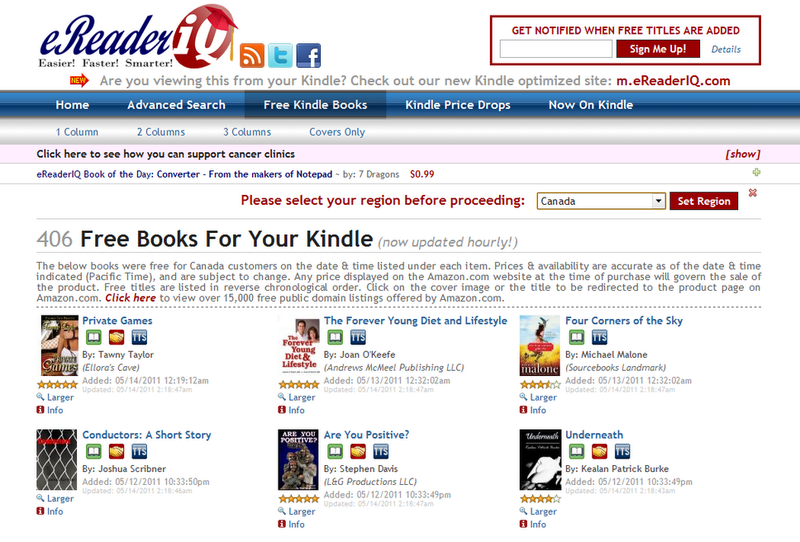 eReaderIQ is a great service for Kindle readers looking for free and price-reduced eBooks. Hopefully, they will expand to cover other eBook stores as well, like Barnes & Noble, Kobo, and iBooks. If you want more details on using the service, check out this review by Guiding Tech. Where do you find your free eBooks?